at KISS by Monster Mini Golf! Our Private Party Room is stocked with all the amenities for an effortless birthday party – we have thought of everything: paper plates, cups, napkins & utensils, ice cream scoop, cake knife and server, ice for drinks, & bowls for chips. No need to bring decorations, the party room is fully decorated with the most rockin’ decorations. Our Tour Managers will be on site to help you play games with the kids. After you are done with games and cake, they’ll take the party out onto the golf course. They’ll also handle all the clean up!! ROCK STAR Karaoke in Rock & Roll setting w/ fun Rocker host! 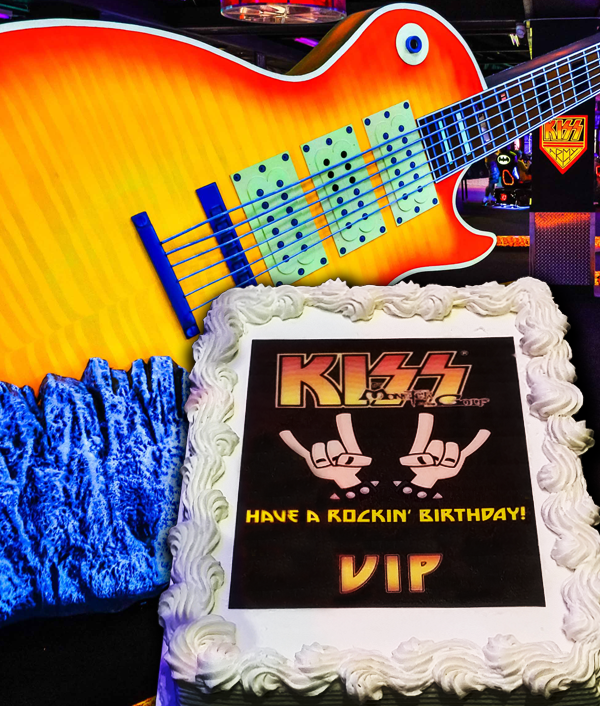 Our KISS Radio DJ will make sure that the Birthday person has a special KISS by Monster Mini Golf experience with not only a fun story to share & cool prizes too!! There is a $50 NON-REFUNDABLE deposit taken upon booking the Unmasked Party package. There is a $100 NON-REFUNDABLE deposit taken upon booking the Rock Star Karaoke package.